Hilarious! How Many British Men Does It Take To Remove A Bike Caught On An Electric Fence? 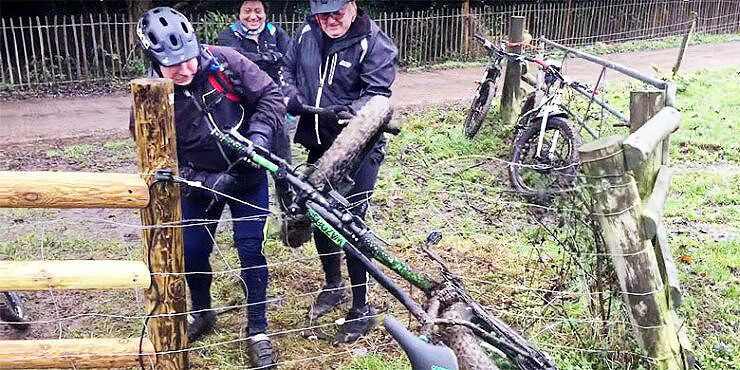 In a farcical scene that wouldn't be out of place in a TV sitcom, three British guys hilariously attempt to free a bicycle that's caught up in an electric fence. If you ever saw a scene like this in a movie you wouldn't believe it. The comedic action is all set to the hysterical tones of the guy filming it, who is obviously just as amused as you will be watching them. It's like watching politicians trying to decide on a how to change a lightbulb. Not only is it baffling as to how the bike got tangled up in the first place, but their clumsiness at trying to untangle it, and the repetition of them getting shocked, again and again.....and again, is surefire comedy gold. OK so you might feel a little bit bad about laughing at their misfortune, especially as it's no doubt painful getting repeatedly electrified. But their misfortune is no doubt a welcome antidote to an otherwise boring day. But still, it's a comedy of errors and they themselves can't help but laugh uncontrollably either. Plus their attempts to avoid touching it by picking up sticks to try to dislodge it are equally buffoonish and just add to the overall humor of the whole affair. It all adds up to great entertainment and probably the funniest thing you're going to see, at least in the next hour or so. Just pray that if you are ever in a similar situation these guys aren't around to help you out. "Whilst pedalling today my mate Paul went to put his bike over a fence." writes the video's uploader. "Half way though he realised that it was electric! So he dropped it on the fence. This is a video of him and my mate Al trying to get it off! Please excuse the swearing and oh yes by the way the clicking sound is the electric pulsing!"